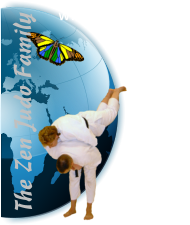 The Zen Judo Syllabus - Yellow to Orange. All techniques from previous sections. Kata Seoi: This throw is also known in other judo forms as ippon seoi nage. At this stage this throw is done around the hip, however, later on during training you may be shown how to make this throw harder by bringing your partner over your hip. This throw concentrates on controlling one arm and letting the rest of uke’s body follow. It can also be an effective self-defence throw when used correctly. Ryo Ashi Dori: This throw is one that has been adapted from a traditional judo technique morote gari. Here, our hands are just used to block our partners legs instead of violently sweeping them away. The main impetus of the throw comes from leaning our shoulder and our body weight into our partner and therefore pushing them over the block. The hand position is deliberate so that the throw can be changed into other techniques if necessary. Hiza Guruma: This is the first foot technique to be introduced and also involves timing and movement. The key to this throw is to break your partners balance and make them take a step forward. When they do, we simply block their leg by placing our foot just below their knee, whilst keeping the top half of their body moving over the block. Once the balance has been lost, we move our blocking foot to the side in order to regain our own balance. Uki Goshi: Literally translated, this throw means “floating hip” which is a very accurate description of the technique. This is a throw, which if you are using strength to complete it, then you are doing it wrong. The idea of this technique is to produce an area for your partner to fall into. Obi Goshi: This throw can also be know as tsuri goshi and it is the first technique in which the person being thrown will be lifted onto their toes before being thrown. The word obi means ‘belt,’ so we are using a grip on the back of our partners belt to help with the lift and throw. Eri Nage: This throw is the first to involve the movement of both the left and right hand. Both hands will take grips on the lapel of your partners jacket. Many yellow belts find this technique confusing and cumbersome, but after a while most realise the potential of this throw to be a fast and powerful technique once a level of confidence has been reached. O Soto Guruma: As this is only the second backwards technique included in this syllabus, it has been developed into three versions. However, the common theme in all of the versions, which is sometimes lost, is the fact that the hip should be doing the throwing part. To an outside observer it may look like this is another leg blocking technique, when in reality it is the hip-to-hip contact that has broken your partners balance. When throwing to the side, your hip should aim for a point past that of your partners as if your partner wasn’t there. To the rear, you should aim for a position that, when your outstretched leg is brought back, should push your hips back and your partners hips forward. When the aim is to bring your partner around to your front, you need you hips slightly lower than your partners so that their hips slide over the top of yours as they are being thrown. Te Hiza Sase: The final throw in this section is designed to demonstrate the use of a hand block against an advancing leg. It also has two versions, a short method and a long method. For both versions, it is still very important to break your partners balance with the arm first. Once the block has been applied, it should stay there until your partners balance has been completely lost. All techniques from previous sections. Kata Seoi: This throw is also known in other judo forms as ippon seoi nage. At this stage this throw is done around the hip, however, later on during training you may be shown how to make this throw harder by bringing your partner over your hip. This throw concentrates on controlling one arm and letting the rest of uke’s body follow. It can also be an effective self- defence throw when used correctly. Ryo Ashi Dori: This throw is one that has been adapted from a traditional judo technique morote gari. Here, our hands are just used to block our partners legs instead of violently sweeping them away. The main impetus of the throw comes from leaning our shoulder and our body weight into our partner and therefore pushing them over the block. The hand position is deliberate so that the throw can be changed into other techniques if necessary. Hiza Guruma: This is the first foot technique to be introduced and also involves timing and movement. The key to this throw is to break your partners balance and make them take a step forward. When they do, we simply block their leg by placing our foot just below their knee, whilst keeping the top half of their body moving over the block. Once the balance has been lost, we move our blocking foot to the side in order to regain our own balance. Uki Goshi: Literally translated, this throw means “floating hip” which is a very accurate description of the technique. This is a throw, which if you are using strength to complete it, then you are doing it wrong. The idea of this technique is to produce an area for your partner to fall into. Obi Goshi: This throw can also be know as tsuri goshi and it is the first technique in which the person being thrown will be lifted onto their toes before being thrown. The word obi means ‘belt,’ so we are using a grip on the back of our partners belt to help with the lift and throw. Eri Nage: This throw is the first to involve the movement of both the left and right hand. Both hands will take grips on the lapel of your partners jacket. Many yellow belts find this technique confusing and cumbersome, but after a while most realise the potential of this throw to be a fast and powerful technique once a level of confidence has been reached. O Soto Guruma: As this is only the second backwards technique included in this syllabus, it has been developed into three versions. However, the common theme in all of the versions, which is sometimes lost, is the fact that the hip should be doing the throwing part. To an outside observer it may look like this is another leg blocking technique, when in reality it is the hip-to-hip contact that has broken your partners balance. When throwing to the side, your hip should aim for a point past that of your partners as if your partner wasn’t there. To the rear, you should aim for a position that, when your outstretched leg is brought back, should push your hips back and your partners hips forward. When the aim is to bring your partner around to your front, you need you hips slightly lower than your partners so that their hips slide over the top of yours as they are being thrown. Te Hiza Sase: The final throw in this section is designed to demonstrate the use of a hand block against an advancing leg. It also has two versions, a short method and a long method. For both versions, it is still very important to break your partners balance with the arm first. Once the block has been applied, it should stay there until your partners balance has been completely lost.